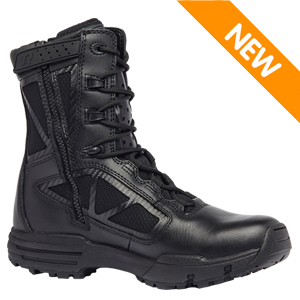 The Tactical Research TR918Z Chrome Men's Side Zip 8in Black Tactical Boot was designed for SWAT team and security professionals on the go. This boot features 100% pure cowhide leather, easily polishable for a professional appearance. A convenient side zipper allows for easy entry and removal when every second counts. An 8 inch military height provides maximum protection from your surroundings. This boot is highly breatheable with an unlined leather & nylon upper. Belleville's new ightweight, stitchless technology also known as "Hot Fusion", features an exoskeleton for low weight & durability. The TR918Z has 100% non-metallic construction and is safe around x-ray equipment and security scanners.